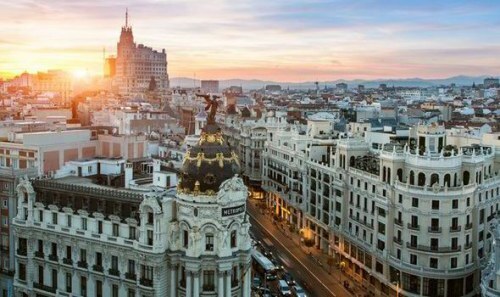 British Airways has dropped the price of a few flights from Calgary to Madrid, Spain down to $669 CAD roundtrip including taxes for winter travel. This is about 38% below the typical best prices for a roundtrip flight from Calgary to Madrid. There are a couple of different flight options. If you choose to connect in London, the flight on the way there has a 10 hour layover, and requires an airport change from Heathrow to Gatwick. You get in at 10 AM and depart that evening, so it's possible to check out London for the day as you make your way from one airport to the other. Or you can connect in Dallas each way, with a 90 minute connection on the way there, and 4 hours on the way home. Or there's some options where you connect in London on the way there, and Dallas on the way home. (different dates are cheaper on one vs the other, so it's worth trying both). TIP: After your Momondo search completes, you may see a message that says 'British Airways has another X similar results'. 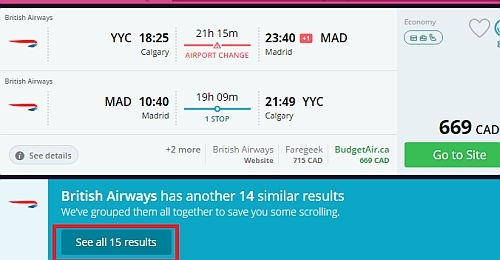 Click on 'See All Results' to see the variety of different flight options ( connecting in London vs Dallas, etc).